In years past, I've watched programs on famous zombie walks around the country. From Pennsylvania to California, people have dressed up for years as zombies and strolled around streets or malls, groaning for fun. Inside I wept, for I knew that Georgia was way too conservative for something like a zombie walk. This year, a group of people proved me wrong. 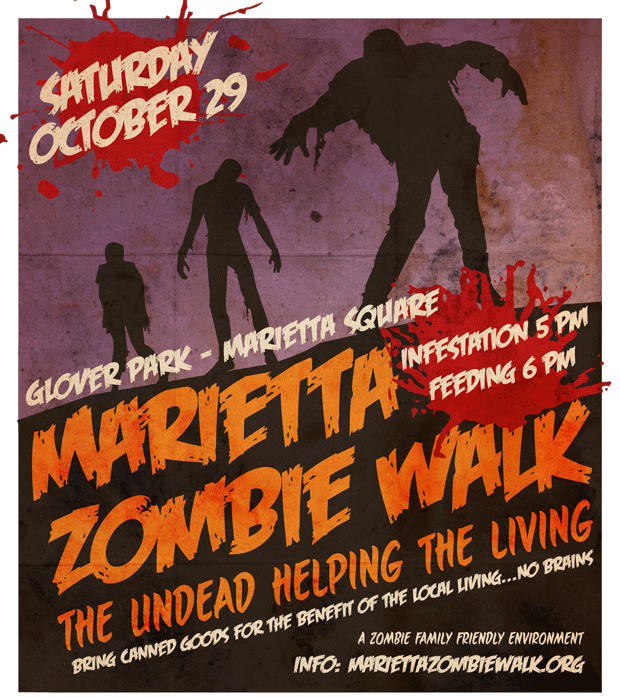 For this coming Saturday is the first annual Marietta Zombie Walk!!!! Sponsored by the City of Marietta, the Strand Theater, and a whole lot of other folks, the citizens of Cobb County now have the opportunity to sport fake death wounds while calling out for "Braaiinnsss". The activities actually start early in the afternoon and continue well into the night. The Earl Strand Theater scheduled four old zombie movies, starting at 2:00pm with "White Zombie". From 2:00pm to 5:00pm, zombie wannabes can show up at The Brickyard to get help with their costume from local makeup artists. Local photographers will also be on hand to record your zombie moment. At 3:30pm, "King of the Zombies" infests the big screen at the Strand. After the walk, the Strand continues the zombie fest with "Teenage Zombies" at 8:00pm, followed by the world famous "Night of the Living Dead" at 10:00pm. Doodlebugs will be offering yarn zombie dolls for the kids for $1.50. The real infestation begins at 5:00pm, as zombies from around the area converge on Glover Park, donating canned food for the living. After all, we need healthy living people if we're going to eat their brains. Then at 6:00pm, the zombie walk begins!!! My family and I will all be dressed up for this event, as well as several of our friends. My son's hoping to have a Zombie Nerf Brigade, and my daughter will be either a Zombie Princess or a Zombie Fairy. Personally, I am going as a bog standard zombie. By 7:00pm this coming Saturday, I'll have one more item checked off of my bucket list. Thanks for sharing this event with us...please, please take pictures! Have you been inside the Strand before? I had no idea there was a beautiful event space by the Marietta Square also. Good to know.